R.L. Allan (Allan) is a British Bible publisher whose legacy extends to 1863. 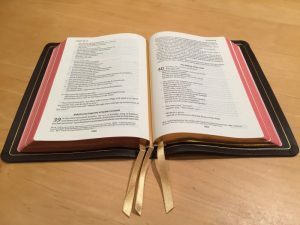 Allan chooses the best Bible translations and the the best typefaces and binds them in Goatskin and Calfskin leather using traditional techniques. Allan Bibles are known for their elegance and durability. R.L. 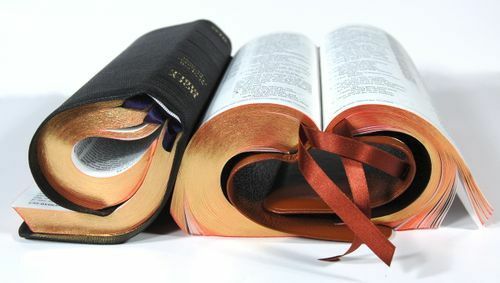 Allan Bible publishers currently bind the following English Bible translations: KJV, ESV, NIV, and NKJV. The NLT is due back in mid 2018, and the NASB, in early 2019. All of Allan’s King James Bibles find their origins in Oxford University book blocks. In reference to the Longprimer-Allan’s most popular KJV, Allan carries the Queen’s exclusive Royal License. First, the Longprimer family is primarily a typeface, created by Oxford University Press, which is crisp, bold and is the most legible of any Allan Bible. This is Allan’s most popular KJV Bible. 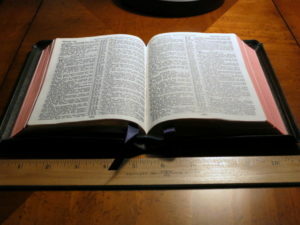 It is a standard size classic reference Bible with large bold print placed on the most opaque Bible paper in the industry. It is available in Highland Goatskin as a Thinline (43) and regular edition in sumptuous Meriva Calfskin (52), and also in a wider margin edition with more opaque paper – the Longprimer Sovereign (62). Like the Longprimer above, the Clarendon family is a typeface, originally created by Oxford University Press. 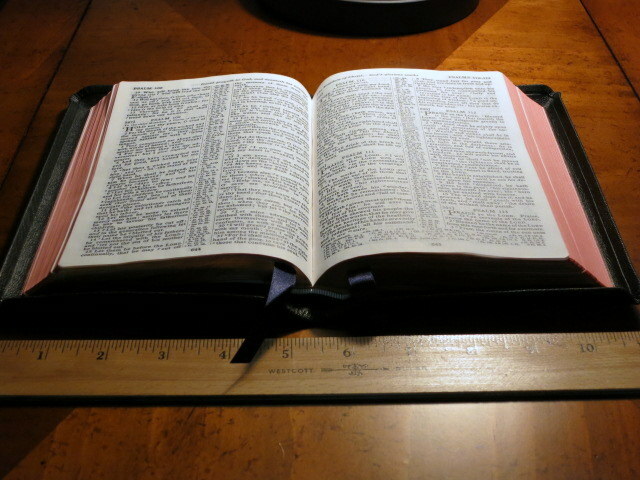 The Brevier Clarendon and Blackface (below) families are similar in that they are both classified as ‘personal size’ Bibles. They are both extremely legible for their sizes. Please read the descriptions below for their differences. We have this family in Black, Brown, and Navy Natural Grain Goatskin (7C). Allan also has a Wide Margin Clarendon Bible with the same pagination as the Brevier Clarendon editions. It is available in Black and Navy Blue Natural Grain Goatskin and Black Buttero Calfskin. The Ruby is the smallest Allan KJV. It’s available in two styles of bindings of Natural Grain Goatskin (103 and 112). 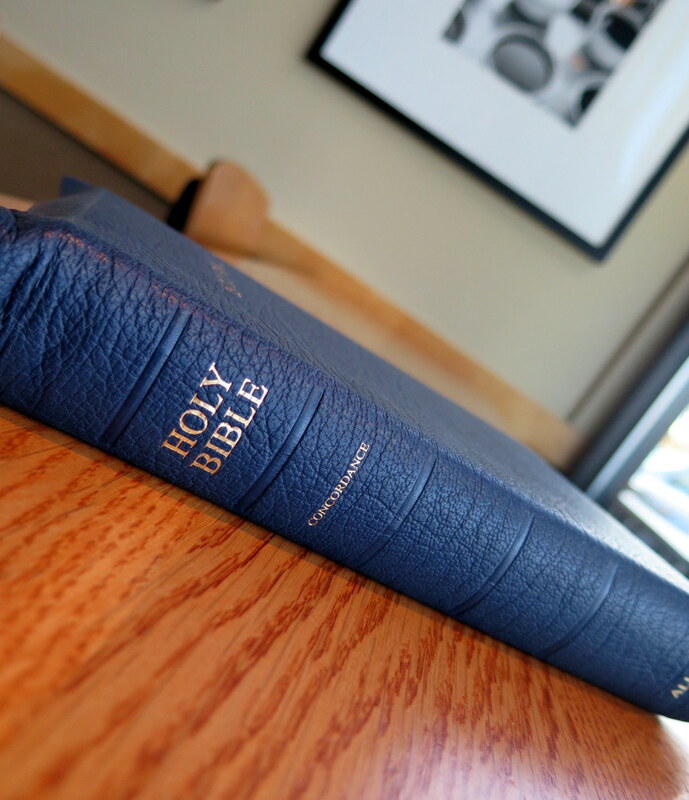 The table below will help you navigate your way through the various KJV editions. (Please use the scroll bar at the bottom.) Allan often changes details between printings, so this information is accurate for May 2018. 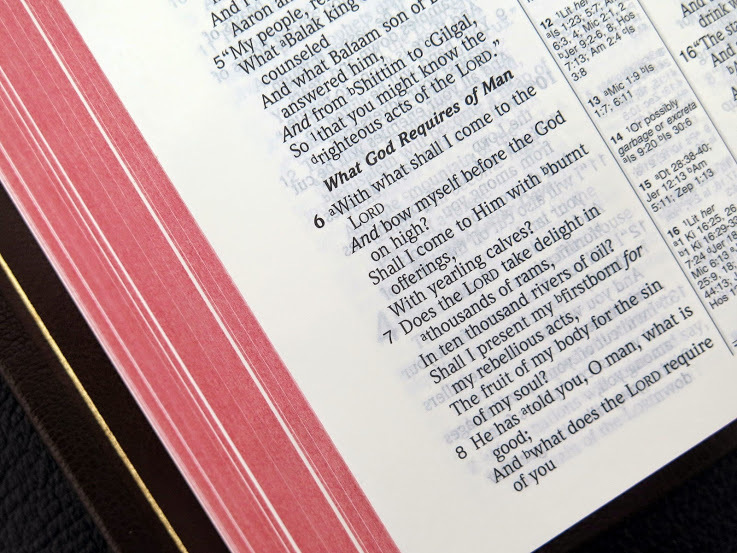 Single Column Text Bible – based on Crossway’s ESV Reader’s Bible and bound in the UK in New Zealand Goatskin. This beautiful Bible is bound in leather lined New Zealand Goatskin with semi-yapp and gilt line inside, red under gold page edges and three ribbon markers. The NIV Classic Reference edition incorporates the NIV 2011 (Anglicized) text, typeset in clear, readable 9pt type, printed on high quality 36gsm Bible paper and includes concordance, colour maps and 32pp feint ruled notepaper. 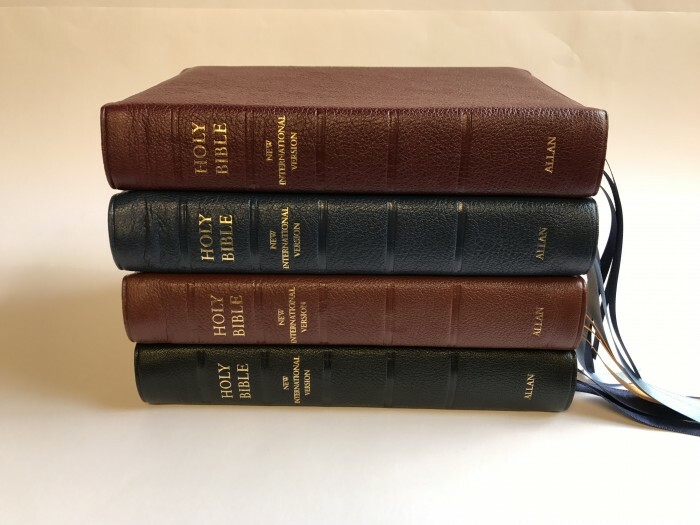 Printed on 32 gsm PrimaBible paper and bound in navy blue, natural grain goatskin with hand-pleated corners and a generous semi-yapp, leather-lined in navy blue with gilt line round the inside, double-sprayed red-under-gold art gilt page edges and red ribbon markers. This modern, black letter larger print single column text setting includes an 8 page Allan presentation and family record section, concordance, color maps and 32 pp of 5 mm feint rule lined notepaper.